Another very hot day ahead for the Iberian Peninsula, France and parts of the UK today. Temperatures expected to soar above 40 °C in the Iberian Peninsula, high 30s in parts of France and over 30 °C in parts of the UK. Monday, June 19 will be another hot day for W Europe. A strong high pressure area has established over the region, with clear skies and hot to very hot weather. This morning the anticyclone is centered over the eastern part of central Europe. Clear skies prevail over much of W-CNTRL Europe. Some cloudiness is present across the Iberian peninsula, associated with a weak low to the west. Temperatures are again expected to reach and locally exceed 40 °C in parts of the Iberian Peninsula, in particular in southwestern Spain and south-central Portugal. Temperatures will approach 40 °C also in parts of northeastern Spain. The entire peninsula will heat up to over 30 °C by mid-afternoon. Forecast maximum temperatures across the Iberian peninsula today, Monday, June 19 by high-resolution models. Map: Meteociel.fr. 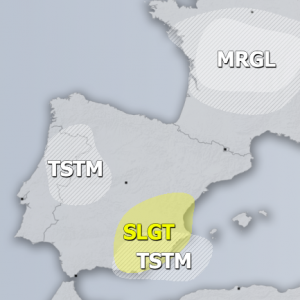 Thunderstorms are expected to form over large parts of the Iberian peninsula later in the afternoon. Moderate instability is present, with virtually no shear and only weak capping inversion – expect widespread thunderstorm initiation. 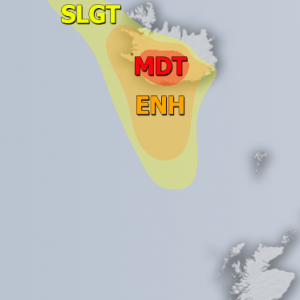 Thunderstorms will be high-based, with danger of dry lightning which will enhance the already high danger of wildfires. Additionally, there will be a significantly enhanced threat of severe winds from (dry) downbursts with these thunderstorms. Forecast MUCAPE (Most Unstable Convective Available Potential Energy) and simulated radar reflectivity. 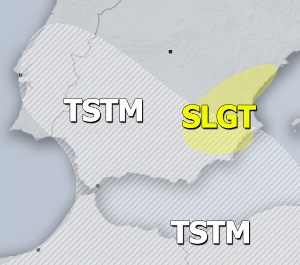 Expect widespread thunderstorms across the Iberian Peninsula in the afternoon. Map: Meteociel.fr. Hot day across France as well, with the hottest weather expected in the southwestern part of the country, where temperatures will approach and possibly reach 40 °C! Most of the country will be at 30 °C or above today. Forecast maximum temperatures across France today, Monday, June 19 by high-resolution models. Map: Meteociel.fr. Southern UK will be hot today, models indicating temperatures reaching 30 °C and locally possibly reaching as high as 33 °C! Ireland will also reach up to 25-26 °C, while Scotland remains cool with daytime highs of 14-16 °C. Forecast maximum temperatures across the UK and Ireland today, Monday, June 19 by high-resolution models. Map: Meteociel.fr. It was a very hot day yesterday across the Iberian peninsula, with daytime highs well over 40 °C in parts of SW Spain and S-CNTRL Portugal; a peak temperature of 42.8 °C was reported in Merida. Most of the peninsula was above 30 °C. In France large parts of the west and south of the country reached up to 35 °C. In the United Kingdom, temperatures went above 30 °C – London Heathrow Airport reported a high of 31.7 °C. Maximum temperatures across the Iberian peninsula on Sunday, June 18. Maximum reported temperature was 42.8 °C in Merida, Spain. Map: Meteociel.fr. Maximum temperatures across France on Sunday, June 18. Temperatures up to 35 °C in S and W parts of the country. Map: Meteociel.fr. Maximum temperatures across the UK on Sunday, June 18. London Heathrow Airport reported a high of 31.7 °C. Map: Meteociel.fr. The heat wave is expected to persist for at least the entire week, with high temperatures expected also in central Europe and parts of S-SE Europe, including northern Italy and the Pannonian basin.